There aren’t any real format rules here, just Four Horsemen Studio’s Mythic Legions posted every week. For this week, I thought I’d reach back and feature the first Masters of the Universe homage, Unkann. Every army needs an arsenal of weapons to carry them to victory in battle and the Legion of Arethyr is no exception. A secret weapon in his own right, Unkann is the legion’s master weapon-smith. A veteran of some of the legion’s bloodiest battles, his expertise has been forged in combat. Determined to supply his brethren with the tools necessary to achieve supremacy, Unkann’s ongoing quest involves supplying the Legion of Arethyr with the deadliest weapons one can imagine. For those not keeping score, the Four Horsemen have been sculpting Masters of the Universe figures, busts, statues, and various other collectibles since the early 2000’s. So naturally, in their own original fantasy property, they have stuck a few references throughout the years. Unkann sounds like Duncan, which of course is the name of He-Man’s ally Man-At-Arms. Unkann the Orc includes a mace, dagger, bone sword, and belt/shoulder strap. He also comes with two optional shoulder armor bits. 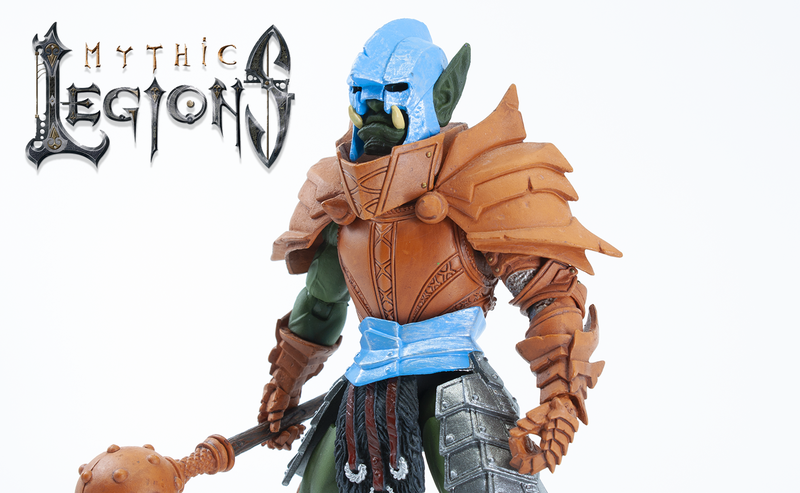 His orange and blue color scheme helps him stand out among the various versions of Orcs in the Mythic Legions line. He was part of the Mythic Legions 1.5 wave, which hit shortly after the first Kickstarter shipped. The wave consisted of Ilgarr, Pixxus, Unkann, and Sir Godfrey. Of those four, I only purchased Unkann as I was attempting to build a World of Warcraft display that would integrate these with the now-defunct NECA Heroes of the Storm toy line.